"We're here for a good time, not a long time, and having a friend like you is as goodas it gets." Agnes Browne could easily be dismissed as a "chick flick" (and after watching it twice I feel like I've got estrogen up to my knees), but there are also other things going on here than the comic antics of the rustic Irish. Starring and directed by Anjelica Huston, this film tries to do a great many things, not always succeeding but usually managing to be interesting. The plot hinges on the offscreen death of Agnes Browne's husband and her efforts to keep her household of seven children above water in 1967 Ireland. Thrown into the mix are her comic problems in getting her husband buried, from having to push the hearse, to ending up at the wrong graveside, as well as her randy friendship with Marion Monks (Marion O'Dwyer) with whom she trades innocent but highly bawdy tales. Underlying this is the resentment of the local loan shark, Mr. Billy (Ray Winstone), who is angry that Agnes manages to pay off the 40 pounds she buries for her husband's funeral; to get even he hooks one of Agnes' sons on gambling and then comes after Agnes to take the money out of her proud hide. Meanwhile, Agnes desperately wants to see Tom Jones who will be shortly coming to give a concert. To top off all the subplots, there's a burly Frenchman who's interested in Agnes giving the film a romantic touch as well. It's hard to assign a category to this film, because it's trying to do so many things at once. Is it a slapstick comedy? a romantic comedy? a maudlin tearjerker? a social criticism? All of them, or none of them? In its brief running time Agnes Browne manages to take all of these points of view, and it becomes confused in its direction. Part of this problem relates to the fact that the opening comedy is so broad and overplayed that it seems almost ridiculous, especially in light of the disparate tacks that it takes afterwards. It's not helped in this matter by a double deus ex machina conclusion that is more irritating than it is satisfying. While Agnes is clearly meant to be a strong character, she has precious little control over her own fate, but is content to let things unravel around her, until the inevitable rescue comes, through no doing of her own. I've often heard it told that if men could hear what women talk about when there are no men around, it'd curl their hair. Judging by that standard, the woman talk in this film is true to life because it's unfailingly lewd to the point of embarrassment whenever the women get together. The acting is generally flourished in broadly painted strokes, with varying degrees of phony brogues tainting the mix. Marion O'Dwyer is quite entertaining as Agnes' best friend, who goes on at length about her two organisms and other randy details. Arno Chevrier is rather nondescript beyond being beefy as the love interest, while Ray Winstone is a quite one-dimensional villain bent on one thing: bringing Agnes down. Wrapping up the package is a 1999 Tom Jones who is more than a little ridiculous playing the 1967 Tom Jones. Perhaps a better hairpiece would have helped. Continuing in the tradition of Mars Attacks!, Jones plays himself and predictably saves the day for all concerned. In all, this is a sometimes agreeable and occasionally quite offensive little picture. Image Transfer Review: The anamorphic picture is quite good indeed. There are excellent colors, with good blacks and overall crisp detail. Shadow detail is excellent as well. No frame damage or speckling was visible, as is to be expected from such a new film. The blue of the frock the children buy for their mother is absolutely breathtaking on this disc. Even Anjelica Huston looks good in it. Audio Transfer Review: Although the Irish music comes through quite nicely and without distortion, there is a great deal of hiss to be heard on the audio track. 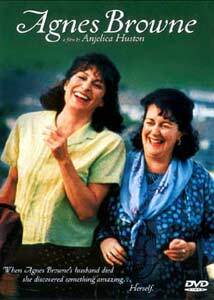 The Irish dialects are somewhat difficult to follow, making the subtitle tracks a real necessity. The surrounds get very little usage, beyond some ambient sound in the church at the funeral. The sound gets the job done. Extras Review: The extras are quite scant. There is a non-anamorphic trailer which essentially gives away the entire story from beginning to end, and brief bios and filmographies for Huston and O'Dwyer. Finally, the insert sheet has some decent production notes, but nothing earth-shaking here. A sometimes overly-broad, but amusing romantic comedy with some nasty undertones. Although the extras are skimpy, it's worth a look, unless you have sensitive ears. Visually gorgeous, the soundtrack is rather limited and suffers from hiss.